As men and women of faith and conscience, we understand that the true moral test of our society is how the weakest and most vulnerable members are treated. Now is the time to act to ensure a specific need of our brothers and sisters is met. Florida lawmakers decided in 2015 against expanding health care coverage to nearly a million low-income, working, uninsured Floridians. As members of the community, we have a responsibility to ensure accessible, quality health care for all. Our health delivery system must be rooted in values that respect individuals, acknowledge human dignity and respond to the needs of the poor and vulnerable. 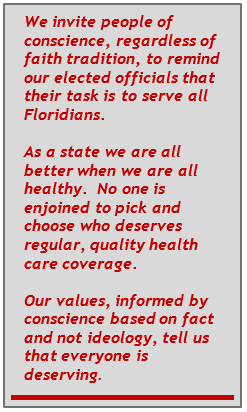 We want to add the faith voice that all merit health care coverage. We find it unconscionable that 3.8 million persons, a population equal to that of Iowa, reside in Florida without health care coverage. We are called to be Good Samaritans, and we expect the conscience of our elected leaders to be guided by that same calling. Expanding health care coverage is the compassionate thing to do. Expansion provides health care on a timely basis – not just treatment in the emergency room. Expansion addresses those most under-served in the current system, especially when facing serious illness that requires hospitalization or surgery such as cancer, heart failure, hernias. Expanding health care coverage is good for Florida’s economy. University of Florida Economists estimate that some 121,000 jobs would be created by health care expansion. Expansion helps control the cost of traditional commercial insurance by eliminating the need for premium surcharges that absorb medical costs from the uninsured. Expanding health care coverage is good for the health of Florida’s state budget. Using taxes we have already paid the Federal government would cover 100% of the cost of expansion until 2017 and after that would never go lower than 90%. This compares highly favorably to established Medicaid funding of a 40% state share. The Urban Institute calculates that every $1 a state invests in Medicaid expansion brings $13.41 in federal funds into the state, generating state savings and revenues that exceed expansion costs. Conscientious leadership tells us what it will do to save lives and create jobs, not simply what it won’t do. Doing nothing on health care coverage is neither an answer nor morally acceptable when lives are at stake and a means to save them is at hand. We call legislators and the Governor to conscientious leadership.